We Kolkatans love our tea as much as our biccies. Tonsil-clogging dry, prefer-to-stay-at-the-bottom-of-the-cup soft, butter-like melty or overpower everything else with ginger - step away from whatever bicci that lies in your tin and hotfoot it over to Quest Mall to try some chewy soft delectable cookies from London's popular bakery Millie's Cookies. If the delicious buttery smell of cookies doesn't already lead you to this cookie bar, then get some tissues, but head to Quest's basement, before. Standing right outside Spencer's liquour store, the pink-and-cream cookie and milk stand of Millie's is our new stop to experience sugar rush. Dunk it in tea or in the milkshake, Millie's is serving up freshly baked cookies with more than ten different flavours on offer, including the classic dark chocolate, vanilla and mixed nuts. Carb counting and gluten allergic peeps stay away, but rest of y'all, don't forget to try their double chocolate cookie and the spice and black current cookie. For some, the cookies would be enough, but those with an incurable sweet tooth like ours, the baked treats are a must try. Lemon tarts, cookie cupcakes to sinfully sweet gateaus - there're a lot to get high on. In need of something savoury to clean the sweetend palate? They've got quiches and pies to help you with it. 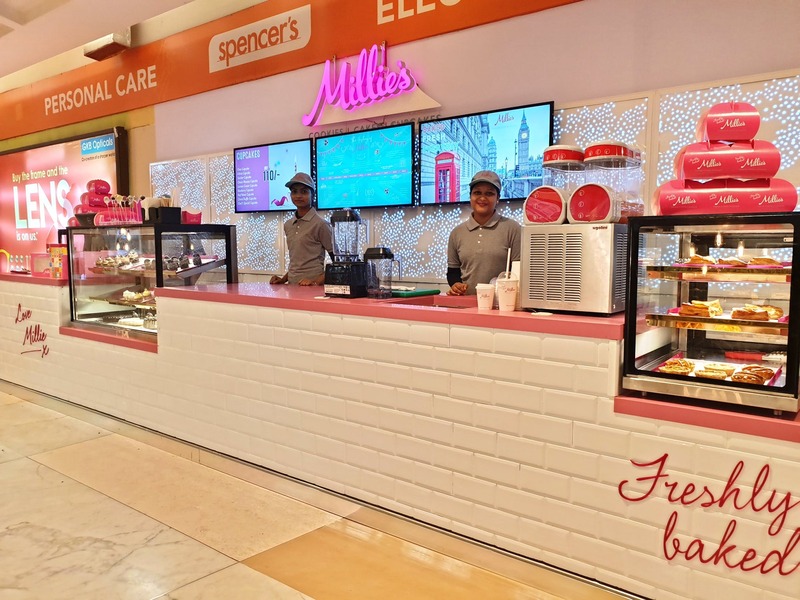 A familiar name in London since the early 1980s, Millie's has just arrived in Kolkata (also, India) and is yet to introduce their well-liked milkshakes. Until then, we'll binge on the cookies. Millie's also has cookie tin, cookie hampers and real pretty stationery (key chains, notebooks and bio degradable pencils) that you can order online from their website.